"We're trying to find the truth." Historically, director John Boorman has made films immersed in a visually rich locales and time periods (Deliverance, Excalibur, Hope and Glory, Beyond Rangoon). Things aren't that much different with the release of In My Country, known elsewhere as Country of My Skull, the original title of the book on which the film is loosely based. The location here is South Africa, and the subject is the human rights brutality of apartheid. The story is set in the days following the end of apartheid, when the South African government established the Truth and Reconciliation Commission to investigate the wholesale violence, murder, kidnappings, and torture. The purpose of the hearings was to give the victims (or relatives of victims) the opportunity to confront their perpetrators, and those accused could be granted amnesty only if they could prove they were telling the truth about what they did, and they then had to admit that they had been following orders. The dramatic spin for the film revolves around the interactions between two very different writers sent to cover the hearings, a white South African poet (Juliette Binoche) and a black American journalist (Samuel L. Jackson). Binoche plays Anna Malan, essentially a fictional version of Country of My Skull author Antjie Krog, here playing a woman full of suppressed revulsion at her own country, while she is torn between absolute disgust and a sense of what was done was out of her control. To counterbalance this Jackson plays Langston Whitfield, a Washington Post reporter who comes to South Africa burdened with his own racially biased set of what it means to be black or white. The message that Boorman conveys is certainly a somber and important one, with much of the dialogue at the hearings about the atrocities coming from actual transcripts, and it is truly horrifying. But as a film, something gets lost during the overall storytelling, between the love/hate relationship between Anna and Langston, and I was struck by too much preaching of the obvious and a thematic repetition that bogged things down about midway through. The two leads are not to blame, Binoche is sweetly doe-eyed and emotionally torn between her life and her country, and there are very few unwatchable Jackson performances. His bristly edginess as Langston is filled with a typically intense bitterness and anger that is eventually softened around the edges a bit towards the film's end. Boorman refers to the material here as an "endless catalog of horror", and even the faults in the dramatic elements between Binoche and Jackson don't necessarily tarnish the message. It just doesn't make the film 100% satisfying as evenly rendered storytelling. The problem is the hearings don't always match the movement of the subplot drama, and it is as if they sometimes come from two different films. It seems clear that Boorman wanted to get a message across, and he does that in very bold strokes, but there is an unevenness to the fictional portions. Image Transfer Review: Sony has issued Boorman's film in 1.85:1 anamorphic widescreen, a clean, well-detailed transfer that sports natural, warm colors. Likewise with black levels, which hold up as quite solid throughout. No major compression issues to be found here. Audio Transfer Review: Audio is presented Dolby Digital 5.0 surround, and this is a largely front-centric mix, with some minor directional movement across the front channels. Dialogue is clean and clear at all times, and the frequent doses of indigenous music is equally robust. Extras Review: Extras include a commentary from director John Boorman, and while I didn't particularly enjoy In My Country overall, I found his comments to be almost more interesting than the film itself. He keeps the info flowing at a steady clip, full of historical background, location facts and random tidbits like native South African Charlize Theron was once in contention for the lead role or schmoozing The Washington Post for the blessing to use their name. There are four deleted scenes available with optional commentary from director Boorman. A couple are of particular interest, and feature Jackson's character at home prior to his visit to South Africa, where we get a chance to see his wife and child. Also provided are a set of six interview segments, with a full range of background on the project from Juliette Binoche (05m:20s), director Boorman (12m:24s), screenwriter Anne Peacock (16m:33s), producer Robert Chartoff (13m:05s), producer Lynn Hendee (15m:58s), and producer Mike Medavoy (07m:45s). The disc is cut into 22 chapters, and features optional French subtitles. The crimes of apartheid serve as the background for John Boorman's recitation of the evils that men do, but it never completely gels as a film. 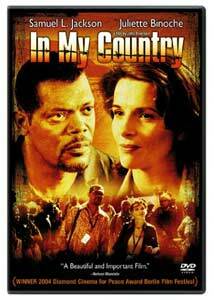 Samuel L. Jackson and Juliette Binoche do their best to make the fictional parts work, as does Brendan Gleeson in a small role as a calmly psychopathic Afrikaner.